- The conference on 4th March, and associated field day in June on "Better Trees, Better Profits". This is reported upon elsewhere in the Journal by Jo Clark. - The Sycamore Group, under the Chairmanship of Michael Carey, has been reasonably successful in raising funds for its work from COFORD, The Forestry Commission and Woodland Heritage. - Support for the work of other BIHIP groups has continued from the four main sponsors of recent years, the Forestry Commission, DEFRA, Woodland Heritage and the Royal Forestry Society. Support has also been obtained from Tetrapak and the Scottish Forestry Trust. - BIHIP now has a formal charitable arm, the British and Irish Hardwoods Trust, which is a recognised charity in the UK, and is going through the procedures to become recognised in the Republic of Ireland. The advantages of this charitable status are that many potential funders were previously unable to give money to BIHIP because they could only give to charities. This hurdle has now been overcome. - Peter Savill and Jason Hubert will take over from Jeff Burley and Gabriel Hemery as Chairman and Secretary of BIHIP. John Davis remains Treasurer. Discussion in the 9-year-old improved birch stand at Bolfracks. BIHIP has seven species groups, dealing with the genetic improvement, by selection and breeding, of ash, birch, cherry, oak, sycamore, sweet chestnut and walnut. A proposal to establish an eighth group, dealing with "Minor Species" will be pursued. It will deal with potentially valuable species like the wild service tree (Sorbus torminalis) and other Sorbus species. 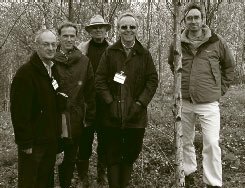 In 2004, the Birch Group was able to demonstrate its work during the annual meeting and field day (21-22 October) based at Pitlochry, Perthshire. This was the first time a meeting had been held in Scotland. The day was organised by Drs Barbour (Chairman of the Birch Group), Hubert Malcolm (Secretary), Samuel and Worrell. There were about 40 participants who came from Great Britain and Ireland. 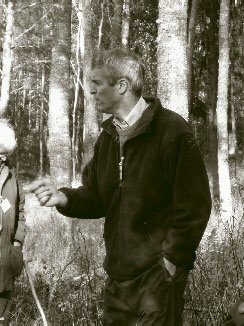 Dr Bob McIntosh, Director, Forestry Commission Scotland, was the guest speaker at the evening meal and also spent the field day with the group. In his speech he gave some very positive and encouraging remarks about where he saw the position of broadleaves in Scotland and announced that a working group would soon be set up to develop recommendations for increased broadleaved planting. He recognised their values to the environment, and said that planned measures should encourage significantly increased planting in the near future. He repeatedly emphasised the importance of growing the trees economically if they are to be produced in a sustainable manner, and not rely on the state for funding. 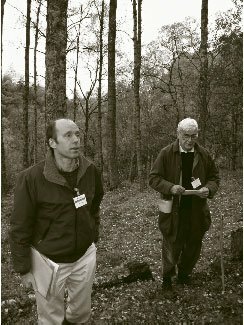 Bob McIntosh’s views are in marked contrast to those of the English Forestry Commission’s hierarchy. They consign broadleaves to fulfilling amenity and biodiversity roles only, which many believe may not be sustainable when government support policies change. England has by far the biggest area of broadleaves - significantly more than in Ireland, Scotland and Wales combined - with two thirds of its forest area being broadleaved. It also has much better soils and climatic conditions for growing them. 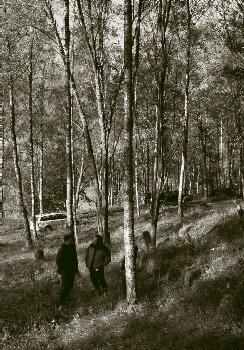 Birch improvement, as opposed to provenance studies, started early in 2003 with the selection of superior (plus) trees on a regional basis, mainly in the Tay and Tummel valleys. They originate from 50-230 m above sea level. The first stop was to see an excellent example in a wood at Killiekrankie. Most of the selected trees had smooth bark, which is correlated with straight grain and strength. The extent to which such smooth-barked trees should be selected, as opposed to those with rougher bark which tend to have more attractive, patterned, wood grain, but less strength and straightness, is still unresolved. Seven to ten cuttings from each plus tree have been grafted onto rootstocks and will be grown on in a polytunnel breeding orchard next year. The all-inclusive costs, from plus tree selection to seed production, are estimated to be of the order of £15,000. Such an orchard should be in full seed production five years after establishment, and give significant genetic improvement. Seed from it would be classified as a "qualified" (i.e. selected). Ideally progeny trials would also be carried out, but no plans exist for these at present. 30-40 year rotations are anticipated to provide timber for furniture and flooring. This approach, possible with birch, will allow improved seed to be produced in great quantities and marketed very quickly, unlike most of the other BIHIP species. However, the most immediate (i.e. within one year) way of improving genetic quality by about 5%, for any species, is to collect seed from registered seed stands, and this was the topic for discussion at the second stop, at Bonskeid Estate (owner Andrew Barbour - Chairman of the Birch Group). Seed stands contain trees that are superior to those in other stands in the same ecological zone. They have to consist of at least 200 trees. At Bolfracks, the group saw an impressive, as yet unthinned, stand of nine-year-old birch planted from selected seed, and also one of the selected ash trees, used by the Ash Group. Joanna Clark described this programme briefly. The final stop, at Craigvinean was to see a birch provenance experiment, planted in 1997. This contained provenances from Yorkshire up to north Scotland and from a range of altitudes. The more southerly provenances were growing more vigorously than the local material and in some cases the differences were of the order of 80% greater height growth by year 6. This was possibly due to the longer period that the southern provenances grew each year, highlighted by the contrasting leaf fall and coloration visible in the trial. Of the local provenances, the lower elevation ones were outperforming the higher elevation examples. A note of caution was advised since the trial is still young and some extreme weather could alter the results in the long term.